The SERSCIS (Semantically Enhanced Resilient and Secure Critical Infrastructure Services) project researched and developed adaptive service-oriented technologies for creating, monitoring and managing secure, resilient and highly available information systems underpinning critical infrastructures, so they can survive faults, mismanagement and cyber-attack, and automatically adapt to dynamically changing requirements arising from the direct impact on the critical infrastructure from natural events, accidents and malicious attacks. decision support tools that exploit underlying semantic models to provide situational awareness of system status and threats. Semantic system models enable a unified approach across all these developments. 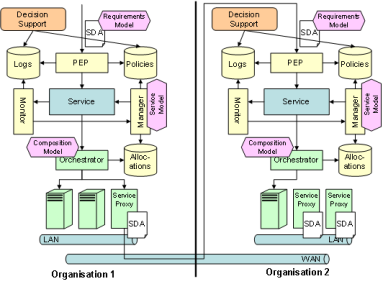 Semantic requirements models lead to reliability statements in service dependability agreements, which can be used by adaptive composition mechanisms, allowing management of larger composed systems to meet their requirements. These innovations have been validated in an information-intensive critical transport infrastructure that requires richly interconnected ICT: air traffic flow control and airport airside process optimisation through collaborative decision making in airports. Requirements have also been captured for a second such infrastructure (inter-modal port community operations) to ensure that the technology developed is generic enough to be used in multiple sectors. The SERSCIS project was a 49 month project funded by the EC FP7 framework programme. SERSCIS has received EC research funding.